South Africa’s legislative capital is known for its fascinating history and cutting edge culture; and nowhere are these two elements more apparent than at the V&A Waterfront. Located at the foot of Signal Hill and washed by the deep blue waters of Table Bay, the Waterfront is Cape Town’s tourist showpiece—a place where crowds gather to eat, drink, shop, socialize and admire breathtaking views of Table Mountain. There are a hundred ways to spend your time at the V&A Waterfront, with activities ranging from helicopter tours of the bay to some of the city’s top-rated restaurants and sightseeing attractions. Start your V&A Waterfront experience with a guided walking tour. 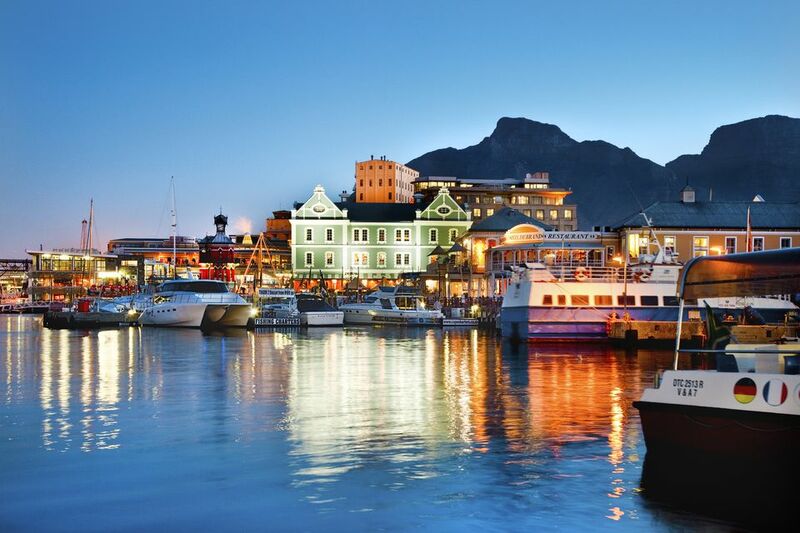 The Waterfront is part of Cape Town’s working harbor, whose history dates back to 1654 when the first jetty was built by famous Dutch colonist Jan van Riebeeck. Your guide will introduce you to the landmarks that make up the area’s rich history—including Breakwater Prison, which housed the British convicts responsible for building the harbor breakwater; and SAS Somerset, the world’s last boom defense vessel. Tours last approximately 1.5 hours and depart daily from Chavonnes Battery Museum at 11:00 a.m. and 2:00 p.m. Tickets cost R150 per adult, or R20 per child under the age of 16. A vast, light-filled warehouse providing space for more than 150 individual vendors, the Watershed specializes in the very best South African art and crafts with many of its high-quality products made locally in the Cape Town area. This is not your average African market—the prices are high and haggling is not expected. However, it offers a chance to invest in art, jewelry, fashion and home decor created by some of the most exciting designers in South Africa. Make sure to visit the Watershed’s Jubilee Exhibition Hall, too, which hosts regular live entertainment, workshops and exhibitions. Cape Town is often voted one of the most scenic cities in the world. To see it in its full glory, book a helicopter tour with one of the charter companies based at the V&A Waterfront. Both Cape Town Helicopters and NAC Helicopters offer various sightseeing flights, ranging from 15-minute tours of the city itself (including landmarks like Camps Bay, the Clifton beaches and the Twelve Apostles hotel) to 50-minute flights along the length of the Cape Peninsula to the Cape of Good Hope. Whichever option you choose, the sight of the city and Table Mountain nestled between False Bay and the Atlantic Ocean is one you’ll never forget. Flights start at around R1165 per person. Just south of Cape Town, the tropical Indian Ocean meets the temperate Atlantic, creating a unique ecosystem defined by its incredible diversity of marine life. Two Oceans Aquarium reflects that diversity with magnificent, immaculately maintained displays of sea creatures from all over South Africa and beyond. Meet ragged-tooth sharks at the Predator Exhibit, or fall in love with the Penguin Exhibit's comical colony of African penguins. Feeding times and regular talks add an educational element, while kids love the touch tanks and walk-through underwater tunnel. For a truly immersive experience, consider signing up for a scuba dive in the I&J Ocean Exhibit. If you’d rather be on the water than under it, check out the harbor cruise companies based at the V&A Waterfront. There are plenty to choose from, both in terms of the itineraries offered and the vessels themselves. The Jolly Roger pirate ship is a firm favorite with families, while the Peroni catamaran’s romantic sunset cruise includes complimentary Champagne. Prices vary according to which charter you choose. Whatever you decide, keep an eye out for Cape Town landmarks (like Robben Island, the Clifton beaches and beautiful Blouberg beach); as well as local wildlife including the V&A Waterfront’s inquisitive resident Cape fur seals. After a busy morning, you’re likely to be in need of refreshment. There are countless restaurants to choose from at the V&A Waterfront, but for the most eclectic dining experience, head to the V&A Food Market. Housed in a historical pump house, the market features more than 40 vendors selling gourmet street food from all over the world. In the mood for Mexican burritos? You’ll find them next to stalls selling Knysna oysters, hand-crafted chocolates, Belgian waffles and Thai noodles. The market also creates a vibrant atmosphere with regular live music, while licensed bars sell the finest Western Cape craft beers and wines by the glass. Take your meal outside into Nobel Square, a lively public space at the heart of the V&A Waterfront perfect for picnicking, people-watching and soaking up the sunshine. There are large trestle tables arranged along the market side, where you can eat elbow-to-elbow with native Capetonians and fellow visitors. The square is named for the four bronze statues of South Africa’s Nobel Peace Prize laureates that stand along the edge closest to the water. These life-size representations of Nelson Mandela, Albert Luthuli, Desmond Tutu and F.W. de Klerk make for a wonderful photo opportunity, especially on clear days when Table Mountain is visible in the background. South Africa is famous for its high quality diamonds, and at the Cape Town Diamond Museum you can learn all about the country’s connection to the precious stones. You’ll see historical artifacts and mining gear that dates back to the discovery of the first South African diamond in 1867; an event that sparked a legendary diamond rush and changed the course of the country’s history. You’ll also learn about the modern diamond industry, including how the raw stones are graded and transformed into spectacular pieces of jewelry. Admission is free! At night, the V&A Waterfront transforms into a festive playground complete with street entertainers, live music and hundreds of sparkling lights. Wander along the promenade, admiring the spectacle of the illuminated Cape Wheel and soaking up the sounds and scents spilling from the waterfront restaurants. Stop in for a craft beer and good conversation at one of the many pubs; or for a fine dining experience at celebrated seafood restaurants like Firefish or Baia. The Cape Town Comedy Club is known around the world for the quality of its stand-up performances, while pop-up bars add to the party atmosphere selling craft gins and Western Cape wines. The V&A Waterfront is also the gateway to Robben Island, one of Cape Town’s top attractions. The historic penal colony is located approximately 18 kilometers offshore, and the best way to get there is on a Robben Island ferry tour. Tours depart from the Nelson Mandela Gateway at the V&A Waterfront and last for 3.5 hours. They offer a moving insight into the prison where the iconic former president spent 18 years of his 27-year sentence (and where many other political prisoners were incarcerated for their role in the fight against apartheid). Tours depart at 9:00 a.m., 11:00 a.m. and 1:00 p.m. and cost R340 per adult.